Since the PyPy 2.2 release last month, more progress has been made on the NumPy compatibility front. Initial work has been directed by running the NumPy test suite and targeting failures that appear most frequently, along with fixing the few bugs reported on the bug tracker. - Many missing/broken scalar functionalities were added/fixed. The scalar API should match up more closely with arrays now. Most of these improvements went onto trunk after 2.2 was split, so if you're interested in trying them out or running into problems on 2.2, try the nightly. Thanks again to the NumPy on PyPy donors who make this continued progress possible. One of the RaspberryPi's goals is to be a fun toolkit for school children (and adults!) to learn programming and electronics with. Python and pygame are part of this toolkit. Recently the RaspberryPi Foundation funded parts of the effort of porting of pypy to the Pi -- making Python programs on the Pi faster! Unfortunately pygame is written as a Python C extension that wraps SDL which means performance of pygame under pypy remains mediocre. To fix this pygame needs to be rewritten using cffi to wrap SDL instead. RaspberryPi sponsored a CTPUG (Cape Town Python User Group) hackathon to put together a proof-of-concept pygame-cffi. The day was quite successful - we got a basic version of the bub'n'bros client working on pygame-cffi (and on PyPy). The results can be found on github with contributions from the five people present at the sprint. While far from complete, the proof of concept does show that there are no major obstacles to porting pygame to cffi and that cffi is a great way to bind your Python package to C libraries. Amazingly, we managed to have machines running all three major platforms (OS X, Linux and Windows) at the hackathon so the code runs on all of them! We would like to thank the Praekelt foundation for providing the venue and The Raspberry Pi foundation for providing food and drinks! Simon Cross, Jeremy Thurgood, Neil Muller, David Sharpe and fijal. The next PyPy sprint will be in Leysin, Switzerland, for the ninth time. This is a fully public sprint: newcomers and topics other than those proposed below are welcome. For a change, and as an attempt to simplify things, I specified the dates as 11-19 January 2014, where 11 and 19 are travel days. We will work full days between the 12 and the 18. You are of course allowed to show up for a part of that time only, too. Please confirm that you are coming so that we can adjust the reservations as appropriate. The rate so far has been around 60 CHF a night all included in 2-person rooms, with breakfast. There are larger rooms too (less expensive per person) and maybe the possibility to get a single room if you really want to. You need a Swiss-to-(insert country here) power adapter. There will be some Swiss-to-EU adapters around -- bring a EU-format power strip if you have one. We're pleased to announce PyPy 2.2.1, which targets version 2.7.3 of the Python language. This is a bugfix release over 2.2. PyPy is a very compliant Python interpreter, almost a drop-in replacement for CPython 2.7. It's fast (pypy 2.2 and cpython 2.7.2 performance comparison) due to its integrated tracing JIT compiler. an issue in sockets' reference counting emulation, showing up notably when using the ssl module and calling makefile(). If sys.maxunicode==65535 (on Windows and maybe OS/X), the json decoder incorrectly decoded surrogate pairs. Note that CFFI 0.8.1 was released. Both versions 0.8 and 0.8.1 are compatible with both PyPy 2.2 and 2.2.1. CFFI 0.8 for CPython (2.6-3.x) has been released. What's new: a number of small fixes; ffi.getwinerror(); integrated support for C99 variable-sized structures; multi-thread safety. Update: CFFI 0.8.1, with fixes on Python 3 on OS/X, and some FreeBSD fixes (thanks Tobias). 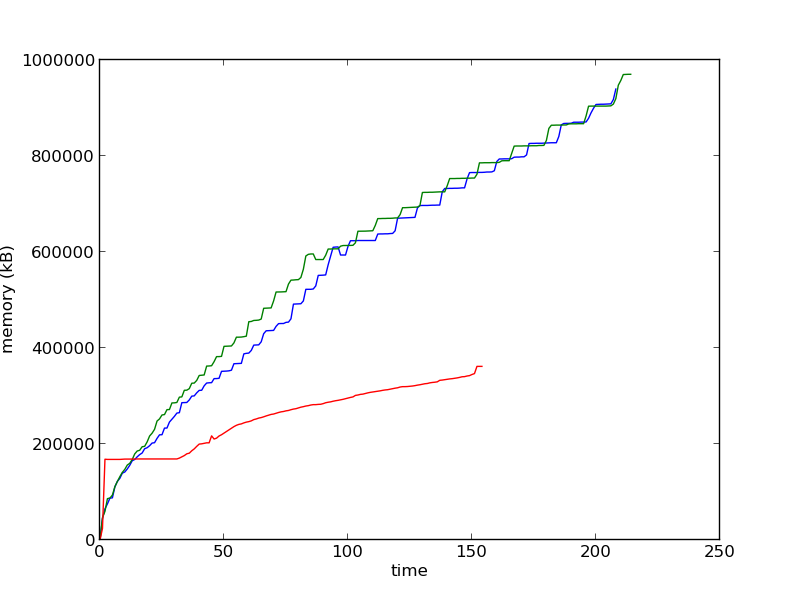 The biggest change is that we shifted to using an external fork of numpy rather than a minimal numpypy module. The idea is that we will be able to reuse most of the upstream pure-python numpy components, replacing the C modules with appropriate RPython micronumpy pieces at the correct places in the module namespace. The numpy fork should work just as well as the old numpypy for functionality that existed previously, and also include much new functionality from the pure-python numpy pieces that simply hadn't been imported yet in numpypy. However, this new functionality will not have been "hand picked" to only include pieces that work, so you may run into functionality that relies on unimplemented components (which should fail with user-level exceptions). This setup also allows us to run the entire numpy test suite, which will help in directing future compatibility development. The recent PyPy release includes these changes, so download it and let us know how it works! And if you want to live on the edge, the nightly includes even more numpy progress made in November. To install the fork, download the latest release, and then install numpy either separately with a virtualenv: pip install git+https://bitbucket.org/pypy/numpy.git; or directly: git clone https://bitbucket.org/pypy/numpy.git; cd numpy; pypy setup.py install. We also began working on __array_prepare__ and __array_wrap__, which are necessary pieces for a working matplotlib module. We're pleased to announce PyPy 2.2, which targets version 2.7.3 of the Python language. This release main highlight is the introduction of the incremental garbage collector, sponsored by the Raspberry Pi Foundation. Our Garbage Collector is now "incremental". It should avoid almost all pauses due to a major collection taking place. Previously, it would pause the program (rarely) to walk all live objects, which could take arbitrarily long if your process is using a whole lot of RAM. Now the same work is done in steps. This should make PyPy more responsive, e.g. in games. There are still other pauses, from the GC and the JIT, but they should be on the order of 5 milliseconds each. bot, but PyPy takes 8-10 minutes. but then we'd abort, and reap none of the benefits. file path out of it. years spent investing in meta-tracing research. The sprint in London was a lot of fun and very fruitful. In the last update on STM, Armin was working on improving and specializing the automatic barrier placement. There is still a lot to do in that area, but that work is merged now. Specializing and improving barrier placement is still to be done for the JIT. But that is not all. Right after the sprint, we were able to squeeze the last obvious bugs in the STM-JIT combination. However, the performance was nowhere near to what we want. So until now, we fixed some of the most obvious issues. Many come from RPython erring on the side of caution and e.g. making a transaction inevitable even if that is not strictly necessary, thereby limiting parallelism. Another problem came from increasing counters everytime a guard fails, which caused transactions to conflict on these counter updates. Since these counters do not have to be completely accurate, we update them non-transactionally now with a chance of small errors. Now, since the JIT is all about performance, we want to at least show you some numbers that are indicative of things to come. Our set of STM benchmarks is very small unfortunately (something you can help us out with), so this is not representative of real-world performance. We tried to minimize the effect of JIT warm-up in the benchmark results. The machine these benchmarks were executed on has 4 physical cores with Hyper-Threading (8 hardware threads). For comparison, disabling the JIT gives 148s on PyPy-2.1 and 87s on PyPy-STM (with 8 threads). For comparison, disabling the JIT gives 492ms on PyPy-2.1 and 538ms on PyPy-STM. All this can be found in the PyPy repository on the stmgc-c4 branch. Try it for yourself, but keep in mind that this is still experimental with a lot of things yet to come. Only Linux x64 is supported right now, but contributions are welcome. You can download a prebuilt binary from here: https://bitbucket.org/pypy/pypy/downloads/pypy-oct13-stm.tar.bz2 (Linux x64 Ubuntu >= 12.04). This was made at revision bafcb0cdff48. But it has been two years already since PyPy-STM started, and this is our first preview of the JIT integration. Expect major improvements soon: with STM, the JIT generates code that is completely suboptimal in many cases (barriers, allocation, and more). Once we improve this, the performance of the STM-JITted code should come much closer to PyPy 2.1. We're pleased to announce that as of today, the default PyPy comes with a GC that has much smaller pauses than yesterday. This creates a reference cycle. It means that while we deleted references to a and b from the current scope, they still have a reference count of 1, because they point to each other, even though the whole group has no references from the outside. CPython employs a cyclic garbage collector which is used to find such cycles. It walks over all objects in memory, starting from some known roots, such as type objects, variables on the stack, etc. This solves the problem, but can create noticeable, nondeterministic GC pauses as the heap becomes large and convoluted. PyPy essentially has only the cycle finder - it does not bother with reference counting, instead it walks alive objects every now and then (this is a big simplification, PyPy's GC is much more complex than this). Although this might sound like a missing feature, it is really one of the reasons why PyPy is so fast, because at the end of the day the total time spent in managing the memory is lower in PyPy than CPython. However, as a result, PyPy also has the problem of GC pauses. To alleviate this problem, which is essential for applications like games, we started to work on incremental GC, which spreads the walking of objects and cleaning them across the execution time in smaller intervals. The work was sponsored by the Raspberry Pi foundation, started by Andrew Chambers and finished by Armin Rigo and Maciej Fijałkowski. 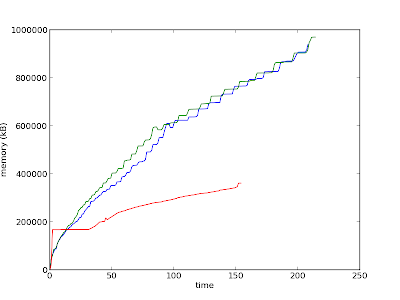 The memory usage of CPython, PyPy with minimark and PyPy with incminimark is shown here. Note that this benchmark is quite bad for PyPy in general, the memory usage is higher and the amount of time taken is longer. This is due to the JIT warmup being both memory hungry and inefficient (see below). But first, the new GC is not worse than the old one. The image was obtained by graphing the output of memusage.py. However, the GC pauses are significantly smaller. For PyPy the way to get GC pauses is to measure time between start and stop while running stuff with PYPYLOG=gc-collect:log pypy program.py, for CPython, the magic incantation is gc.set_debug(gc.DEBUG_STATS) and parsing the output. For what is worth, the average and total for CPython, as well as the total number of events are not directly comparable since it only shows the cyclic collector, not the reference counts. The only comparable thing is the amount of long pauses and their duration. In the table below, pause duration is sorted into 8 buckets, each meaning "below that or equal to the threshold". The output is generated using the gcanalyze tool. As we can see, while there is still work to be done (the 100ms ones could be split among several steps), we did improve the situation quite drastically without any actual performance difference. Here are some nitty gritty details for people really interested in Garbage Collection. This was done as a patch to "minimark", our current GC, and called "incminimark" for now. The former is a generational stop-the-world GC. New objects are allocated "young", which means that they initially live in the "nursery", a special zone of a few MB of memory. When the nursery is full, a "minor collection" step moves the surviving objects out of the nursery. This can be done quickly (a few millisecond) because we only need to walk through the young objects that survive --- usually a small fraction of all young objects; and also by far not all objects that are alive at this point, but only the young ones. However, from time to time this minor collection is followed by a "major collection": in that step, we really need to walk all objects to classify which ones are still alive and which ones are now dead ("marking") and free the memory occupied by the dead ones ("sweeping"). You can read more details here. This "major collection" is what gives the long GC pauses. To fix this problem we made the GC incremental: instead of running one complete major collection, we split its work into a variable number of pieces and run each piece after every minor collection for a while, until there are no more pieces. The pieces are each doing a fraction of marking, or a fraction of sweeping. It adds some few milliseconds after each of these minor collections, rather than requiring hundreds of milliseconds in one go. The main issue is that splitting the major collections means that the main program is actually running between the pieces, and so it can change the pointers in the objects to point to other objects. This is not a problem for sweeping: dead objects will remain dead whatever the main program does. However, it is a problem for marking. Let us see why. In terms of the incremental GC literature, objects are either "white", "gray" or "black". This is called tri-color marking. See for example this blog post about Rubinius, or this page about LuaJIT or the wikipedia description. The objects start as "white" at the beginning of marking; become "gray" when they are found to be alive; and become "black" when they have been fully traversed. Marking proceeds by scanning grey objects for pointers to white objects. The white objects found are turned grey, and the grey objects scanned are turned black. When there are no more grey objects, the marking phase is complete: all remaining white objects are truly unreachable and can be freed (by the following sweeping phase). In this model, the important part is that a black object can never point to a white object: if the latter remains white until the end, it will be freed, which is incorrect because the black object itself can still be reached. How do we ensure that the main program, running in the middle of marking, will not try to write a pointer to white object into a black object? This requires a "write barrier", i.e. a piece of code that runs every time we set a pointer into an object or array. This piece of code checks if some (hopefully rare) condition is met, and calls a function if that is the case. The trick we used in PyPy is to consider minor collections as part of the whole, rather than focus only on major collections. The existing minimark GC had always used a write barrier of its own to do its job, like any generational GC. This existing write barrier is used to detect when an old object (outside the nursery) is modified to point to a young object (inside the nursery), which is essential information for minor collections. Actually, although this was the goal, the actual write barrier code is simpler: it just records all old objects into which we write any pointer --- to a young or old object. As we found out over time, doing so is not actually slower, and might actually be a performance improvement: for example, if the main program does a lot of writes into the same old object, we don't need to check over and over again if the written pointer points to a young object or not. We just record the old object in some list the first time, and that's it. For those of you that happen to be from South Africa: don't miss PyCon ZA 2013, next October 3rd and 4th! Like last year, a few of us will be there. There will be the first talk about STM getting ready (a blog post about that should follow soon). Moreover, general sprints will continue on the weekend (5th and 6th). Afterwards, Fijal will host a longer PyPy sprint (marathon?) with me until around the 21th. You are welcome to it as well! Write to the mailing list or to fijal directly (fijall at gmail.com), or simply in comments of this post. The unicodedata database has been upgraded to 6.0.0.
help (but so does the default branch to a certain degree). 1 failing test about containment of floats in collections. Probably the biggest feature left to tackle is the New GIL. to provide a more fully-fledged initial release. d'Arc, Karl Ramm, Jason Chu and Christian Hudon. This is an update about the Software Transactional Memory subproject of PyPy. I have some good news of progress. Also, Remi Meier will likely help me this summer. He did various investigations with PyPy-STM for his Master's Thesis and contributed back a lot of ideas and some code. Welcome again Remi! I am also sorry that it seems to advance so slowly. Beyond the usual excuses --- I was busy with other things, e.g. releasing PyPy 2.0 --- I would like to reassure people: I'm again working on it, and the financial contributions are still there and reserved for STM (almost half the money is left, a big thank you again if you contributed!). The real reason for the apparent slowness, though, is that it is really a research project. It's possible to either have hard deadlines, or to follow various tracks and keep improving the basics, but not both at the same time. The main blocker was that the STM subsystem, written in C, and the Garbage Collection (GC) subsystem, written in RPython, were getting harder and harder to coordinate. So what I did instead is to give up using RPython in favor of using only C for both. C is a good language for some things, which includes low-level programming where we must take care of delicate multithreading issues; RPython is not a good fit in that case, and wasn't designed to be. I started a fresh Mercurial repo which is basically a stand-alone C library. This library (in heavy development right now!) gives any C program some functions to allocate and track GC-managed objects, and gives an actual STM+GC combination on these objects. It's possible (though rather verbose) to use it directly in C programs, like in a small example interpreter. Of course the eventual purpose is to link it with PyPy during translation to C, with all the verbose calls automatically generated. Since I started this, bringing the GC closer to the STM, I kept finding new ways that the two might interact to improve the performance, maybe radically. Here is a summary of the current ideas. When we run multiple threads, there are two common cases: one is to access (read and write) objects that have only been seen by the current thread; the other is to read objects seen by all threads, like in Python the modules/functions/classes, but not to write to them. Of course, writing to the same object from multiple threads occurs too, and it is handled correctly (that's the whole point), but it is a relatively rare case. So each object is classified as "public" or "protected" (or "private", when they belong to the current transaction). Newly created objects, once they are no longer private, remain protected until they are read by a different thread. Now, the point is to use very different mechanisms for public and for protected objects. Public objects are visible by all threads, but read-only in memory; to change them, a copy must be made, and the changes are written to the copy (the "redolog" approach to STM). Protected objects, on the other hand, are modified in-place, with (if necessary) a copy of them being made for the sole purpose of a possible abort of the transaction (the "undolog" approach). This is combined with a generational GC similar to PyPy's --- but here, each thread gets its own nursery and does its own "minor collections", independently of the others. So objects are by default protected; when another thread tries to follow a pointer to them, then it is that other thread's job to carefully "steal" the object and turn it public (possibly making a copy of it if needed, e.g. if it was still a young object living in the original nursery). The same object can exist temporarily in multiple versions: any number of public copies; at most one active protected copy; and optionally one private copy per thread (this is the copy as currently seen by the transaction in progress on that thread). The GC cleans up the unnecessary copies. These ideas are variants and extensions of the same basic idea of keeping multiple copies with revision numbers to track them. Moreover, "read barriers" and "write barriers" are used by the C program calling into this library in order to be sure that it is accessing the right version of the object. In the currently investigated variant I believe it should be possible to have rather cheap read barriers, which would definitely be a major speed improvement over the previous variants. Actually, as far as I know, it would be a major improvement over most of the other existing STMs: in them, the typical read barrier involves following chains of pointers, and checking some dictionary to see if this thread has a modified local copy of the object. The difference with a read barrier that can resolve most cases in a few CPU cycles should be huge. So, this is research :-) It is progressing, and at some point I'll be satisfied with it and stop rewriting everything; and then the actual integration into PyPy should be straightforward (there is already code to detect where the read and write barriers need to be inserted, where transactions can be split, etc.). Then there is support for the JIT to be written, and so on. But more about it later. It is now possible to use subarrays. It is now possible to pickle ndarrays (including those using subarrays), dtypes and scalars, the pickling protocol is the same as numpy's. For June, I plan to work on the nditer class, it seems that there's enough work for an entire month. JIT now supports stackless features, that is greenlets and stacklets. This means that JIT can now optimize the code that switches the context. It enables running eventlet and gevent on PyPy (although gevent requires some special support that's not quite finished, read below). This is the first PyPy release that includes cffi as a core library. Version 0.6 comes included in the PyPy library. cffi has seen a lot of adoption among library authors and we believe it's the best way to wrap C libaries. You can see examples of cffi usage in _curses.py and _sqlite3.py in the PyPy source code. PyPy is a very compliant Python interpreter, almost a drop-in replacement for CPython 2.7.3. It's fast (pypy 2.0 beta 2 and cpython 2.7.3 performance comparison) due to its integrated tracing JIT compiler.